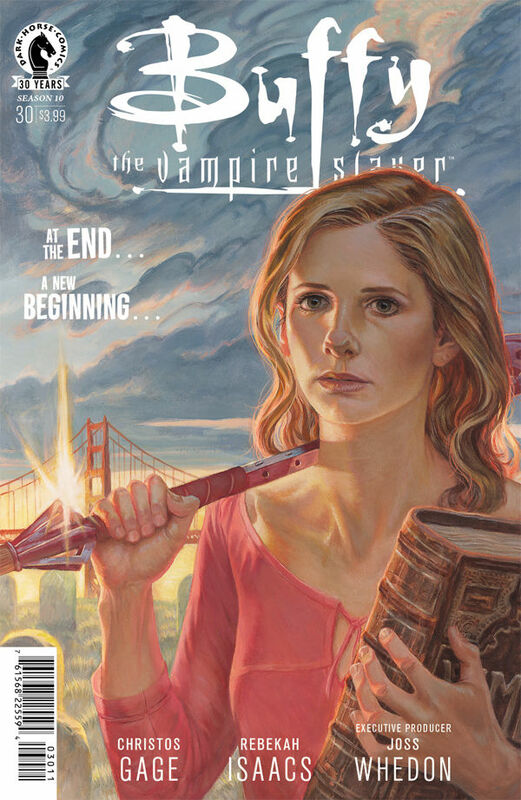 Some endings lead to new beginnings in this issue of the Buffy comic. While the situation has gradually grown worse, with D’Hoffryn’s plans and Anya’s destruction of Xander, even within the darkness there must be the light of hope. We pick up the story with Xander’s apparent death, as he’s now been reduced to a pile of dust by Anya. His friends are, of course, devastated. They’ve lost their closest friend, an adopted brother to some and a significant other to Dawn, and now they must have their revenge. D’Hoffryn and Anya must pay. Willow tries to lash out at them, but they and the fellow minions are protected. 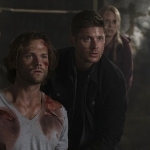 It won’t be that easy for the Scooby Gang to deal with their grief. That’s when Anya starts pushing them, taunting them. She says it’s their fault, that they couldn’t handle the power, so they gave it away. 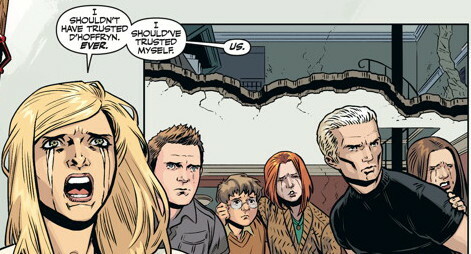 While Spike’s angry at the accusation, Buffy knows she’s right. Because the Slayer was too unsure to take control of the responsibility herself, she let someone evil gain too much power and now he’s destroying everything around him. Buffy starts gearing up, talking about how she wishes she never gave D’Hoffryn the powers, because if the situation was changed she could get her revenge on D’Hoffryn. And that is all the motivation Anya needs to grant her wish. A request for vengeance heard by a vengeance demon, one that seeks to get her own sort of vengeance against the demon who enslaved her, it’s very poetic. And she even brings Xander back from his temporary existence as an intangible ghost. The gang is back together and ready to fight. 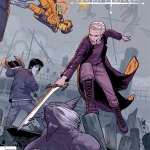 With a now de-powered D’Hoffryn in their midst, the Scooby Gang starts their attack. Unfortunately, it’s not going to be easy, as D’Hoffryn still has some powers of his own to lash out with. And he manages to burn Anya badly during his counter-attacks. She dies in Xander’s arms, with her former lover crying over her. And when D’Hoffryn’s minions witness what he’s done, they all quit at once. Now it’s one against the many, and the vengeance demon has little chance to succeed. Buffy manages to slice off D’Hoffryn’s right hand before he disappears. He retreats to a med center in the Hell Dimension, thinking he will get back in working order and go back to seek his revenge once again, but the gang follow him. They’ve rewritten the Magic Book so that Dawn retains her Key power to open portals, even on Earth. A very handy trick to have. Faced with what is certain doom, D’Hoffryn makes one last-ditch effort to save himself. He offers a deal, to grant them each a wish of their choosing. A temptation to be sure, but not one the gang is willing to take. Instead, Buffy slices his head off and D’Hoffryn is no more. Back at their apartment, the gang are having game night, but Buffy keeps being distracted by what to do with the book. None of them know what to do with it either, since there are positives and negatives no matter which way they go. However, Willow has a potential solution. She suggests that she and Buffy join the Watcher’s Council, since a new group has to take over now, and Spike gets Giles to join as well. Together, they can control the magic and write the rules, with a system of checks and balances as well as having a voice within the construction of this new world. And as we leave the issue, with a glimpse at all the participants in this new Watcher’s Council, there is hope. Maybe this new Council can work after all.